Today we welcome a guest blog post from Andrea Weigl, author of Pickles and Preserves: a Savor the South® Cookbook. Weigl defines the year by her canning sessions. In the winter, she makes bright yellow Jerusalem Artichoke Relish from her backyard crop. In the spring, she conjures up sweet red Strawberry Preserves. In the summer, it’s savory Yellow Squash Pickles and peaches, pickled, brandied, or as a thick butter. And in the fall, she folds her Fig Preserves into a cake famous on North Carolina’s Outer Banks. This book highlights the regional flair that southern cooks bestow on this traditional art of survival in preserving the South’s bountiful harvest. The fifty classic and inventive recipes—from Dilly Beans and Pickled Okra to Muscadine Jam and Habañero Gold Pepper Jelly—will have beginners and veterans alike rolling up their sleeves. In today’s post, Weigl shares a recipe for a family favorite. This recipe is a special bonus (not available in the book) that grew out of an attempt to recreate an old recipe from the Great Depression. One of the things I enjoy most about canning is discovering new recipes. This one for Pear Syrup only happened because I called my mom on the morning before a marathon canning session. I mentioned in passing that I was making Pear Honey. My mother brightened, inquiring about the recipe. She was deflated to hear that Pear Honey was a preserve, like apple butter. She had hoped it was a recipe for a pear syrup that my Grandmother Anna Weigl used to make from the skins of pears. I listened to my mother’s story and decided at that moment to try to recreate my grandmother’s syrup. My grandmother is a mythic figure in my family for her cooking abilities. I did not know her. She had a stroke when I was very young and later died. But I have heard many stories and researched her life. It didn’t surprise me in the least to hear that she made a syrup from what most of us would throw away. Grandma Weigl was a creature of having endured a horrible recession in Germany after World War I, only to emigrate to the United States just in time for the Great Depression. The most telling detail I ever heard about her frugality was this: once her grandchildren were done with their fried eggs, she would scrap the leftover runny yolks back into the frying pan and make her grandchildren eat those scrambled eggs. I know my grandmother had a pear tree in her backyard. 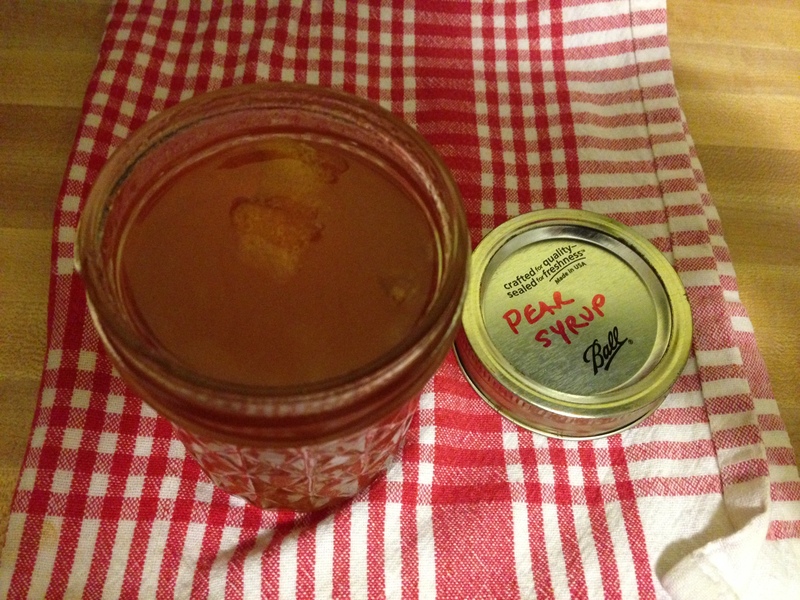 If she made anything out of those pears or store-bought ones, she likely made this syrup using the leftover pear skins that she couldn’t bear to go to waste. Having heard that story right before I would be blessed with a pile of pear skins, I couldn’t just pitch them in the trash can. My recipe below yielded only two jars; one for my family and one for my mother. Having dropped one in the mail to my mom, I hope to hear soon about how my pear syrup compares to her taste memory. Wash two half pint jars, lids, bands and tools in hot soapy water and dry with a clean kitchen towel. Place the jars inside the water-bath canner and fill canner with enough water to cover the jars by 1 inch. Place canning pot on the stove. Place the self-sealing lids in a small saucepan with enough water to cover the lids. Cover with a lid. Peel two long strips of lemon rind off the lemon. Set aside. Then juice the lemon, straining out any seeds. Place juice in a large stainless-steel stockpot or enamel Dutch oven. Add water, sugar, and pear skins. Stir to dissolve sugar. Cook on medium-low heat for about 1 hour. Clip candy thermometer on side of pan to monitor syrup’s progression toward about 225 degrees. Thirty minutes into cooking the syrup, turn the heat on high under the water-bath canner. Turn the heat on medium low under the small saucepan with the lids. Adjust heat if necessary under the small saucepan to maintain a simmer. Place a saucer in the freezer to check the syrup. When the syrup reaches about 225 degrees, pull the saucer from the freezer. Place a small amount of syrup on the chilled saucer and if you can draw a finger through the syrup and the line holds, it is ready. Remove the jars from the canner, pouring out any water. Place the jars on a towel-lined countertop. Place a strip of lemon rind in each jar. Ladle the pear syrup into the jars, leaving 1/4 inch of headspace. Use a thin spatula to stir the contents of the jar to release any air bubbles. Wipe the rim of each jar with a clean damp towel. Place a lid on each jar and then twist on a screw band until tight. Place the jars back in the canner and process for 10 minutes. When done, remove jars from the canner and place on a towel-lined countertop several inches apart. Let cool to room temperature. You should soon hear the “pop” of the lids, signaling a job well done. The syrup can be enjoyed immediately. Andrea Weigl is the food writer for the Raleigh News & Observer. She lives in Raleigh, North Carolina. Her new book Pickles and Preserves: a Savor the South® Cookbook is available now.